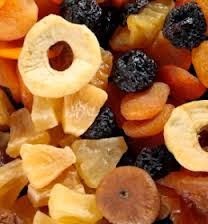 This time Food on Friday is building a collection of dishes using dried fruit in them – whether the dishes are sweet or savoury. Or, indeed, posts about how to dry fruit too! To add to the collection just pop the name of your dish into the first Mr Linky box (plus your blog name/name, if you like) and then paste the url for your post about it into the second box. There are no rules other than having fun! It would be great if you visited some of the other links – to help you pick which I will be pinning each dish to this Pinboard. And if you enjoy Food on Friday, it would be lovely if you invited another blog friend along to join in the fun. If you ask them to leave a comment about it being their first time, we'll know to welcome them properly. The Raisin / Sultana Cake (#8) is very easy and makes a moist cake. I'm thinking of trying it with other dried fruit, too (chopped dried apricots should be nice). I'm sharing my recipe for Lemon Blueberry Granola, one of my favorite flavor combos. Thanks for having me to the party. just shared my pom pom cupcake toppers made from fruit leather! (that's considered dried fruit, right?) thanks! Just made raisin-carrot cole slaw with cashews about a month ago. Incaberries ... something a bit different! Good Morning Carole, It is lovely to join your party and although I have added an unseasonal cake, once tried you will love my Christmas Cake. I hope your computer starts behaving itself soon. PC problems are the worst! You might have to bake yourself silly with some of these dreamy sounding dried fruit recipes. It worries me how bonded I am with my computer! I've got a bunch of recipes for you, using dried cherries, dates, and raisins.